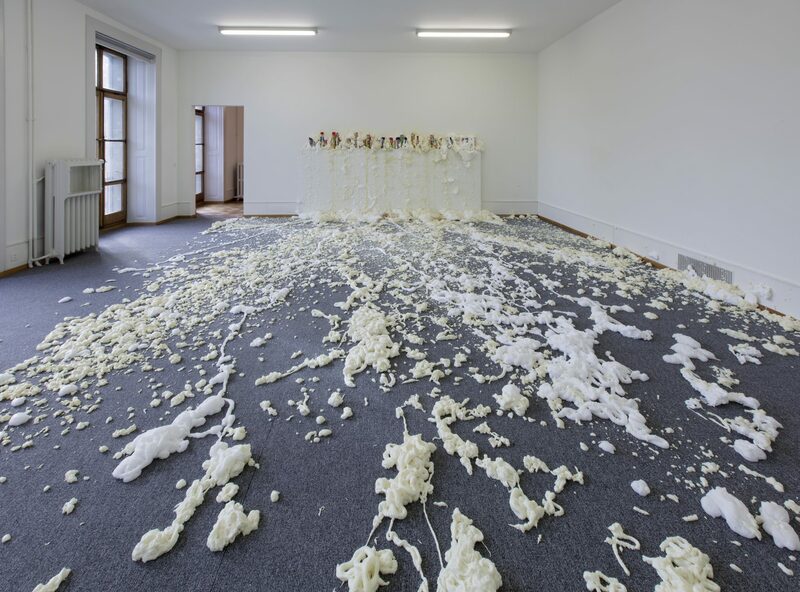 Delphine Reist’s (b.1970, Switzerland) solo exhibition sheds light on a social model apparently close to collapse. 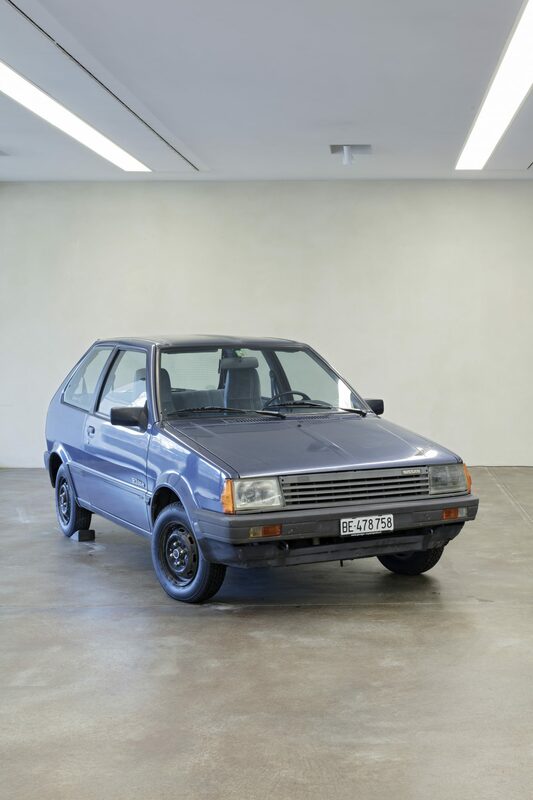 To this end the Geneva artist examines via installations and video the effects of globalisation, rationalisation and automation of our economy. Comparable to a factory consisting of production line, fuel reserves, tool storage, offices or changing rooms, the exhibition recalls a production site strangely withdrawn from reality. An oil barrel rolls undeviatingly through the space. 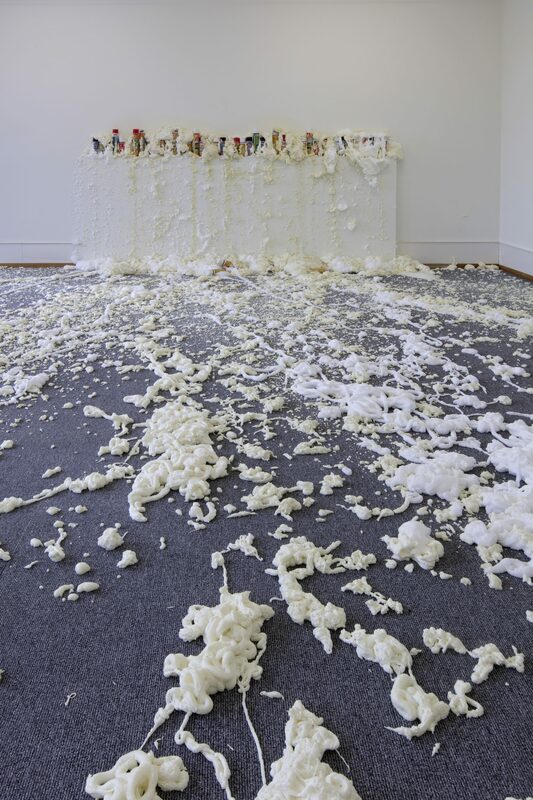 Containers of synthetic foam are made to explode or office chairs revolve on their own axes. Through the transformation of everyday objects into functionless apparatus the artist questions our engineered environment and its self-sustaining momentum without content. Efficiency is translated into irony, functionalism into roguishness. In her most comprehensive presentation to date Delphine Reist produces an image of an economy that has outstripped ideas of progress and has become lost in empty actionism. Delphine Reist began her artistic caree far from the sober exhibition spaces of the art world, in places such as closed down factory buildings, abandoned building sites or vacated office blocks. She made shopping trolleys rotate on a car park or neon tubes fall, as if of their own volition, from their brackets. To this day her method of working is characterised by the appropriation and alienation of the conditions in the places she finds. As a reaction to the current world economy the artist brings together works from fifteen years, drawing our attention to aspects such as the energy debate, badly managed production processes, meaningless administrative jobs or an ambivalent positivism. Objects such as vehicles used in daily life become so altered that they move independently and spookily develop a life of their own. For example the work Parking, 2003 is a car that has been granted complete autonomy. One hears the starter trying to get the motor going and sees it making rudimentary movements. The procedure is repeated, endlessly, almost compulsively. In this way the empty car’s failed attempts to start seem like the last twitchings of an obsolete symbol of wealth that has run out of fuel. The relationships between surveillance and freedom, order and mismanagement are expressed in the work Etagère, 2007. 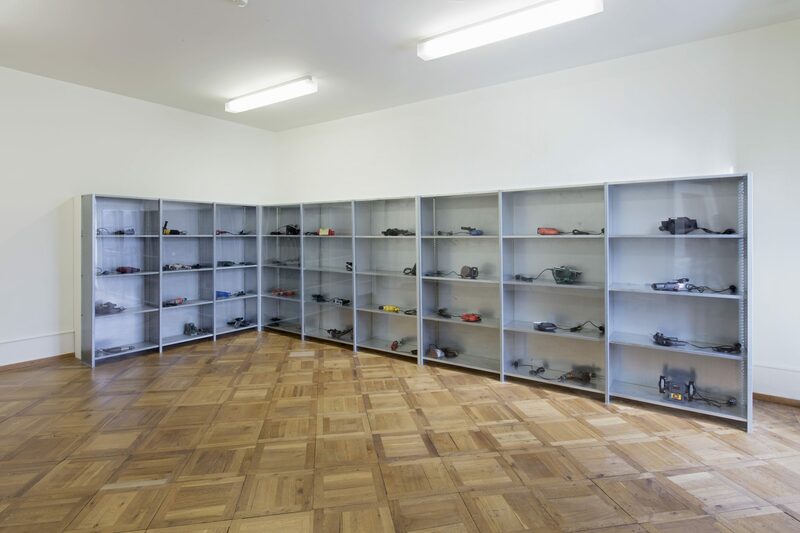 The installation shows tools such as circular saws, shut on shelves behind perspex, that set themselves in motion at varying intervals. The fixed order of the shelves contradicts the unpredictable movements of the tools. For Retour de couche, 2010 a sprinkler system was used that sprayed red paint instead of water. 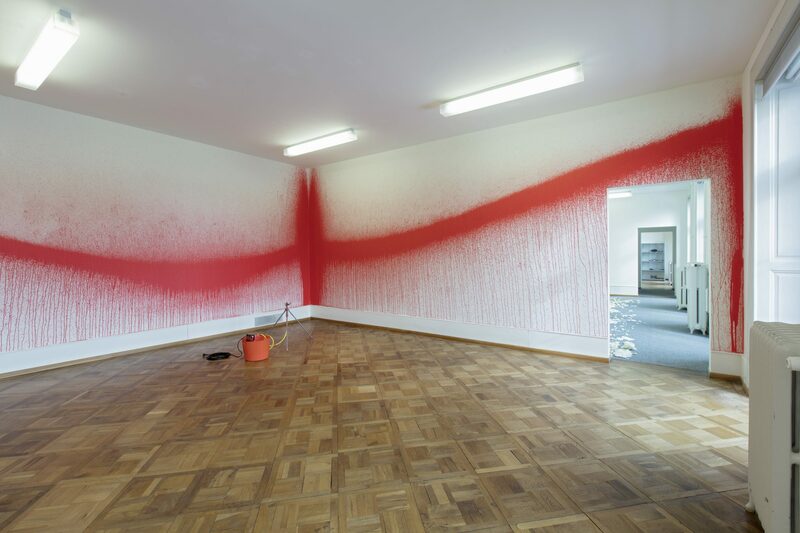 The resulting effect was a chaotic mess of paint marks on the wall. The scene of a total loss of control is an insistent reference to forms of production incompatible with the ecology or to ever-lurking dangers such as bursting oil pipelines. Lofty promises of sustainability and security seem flimsy in this light. The work Carton, 2012 is concerned with excess production and the effects on the market. 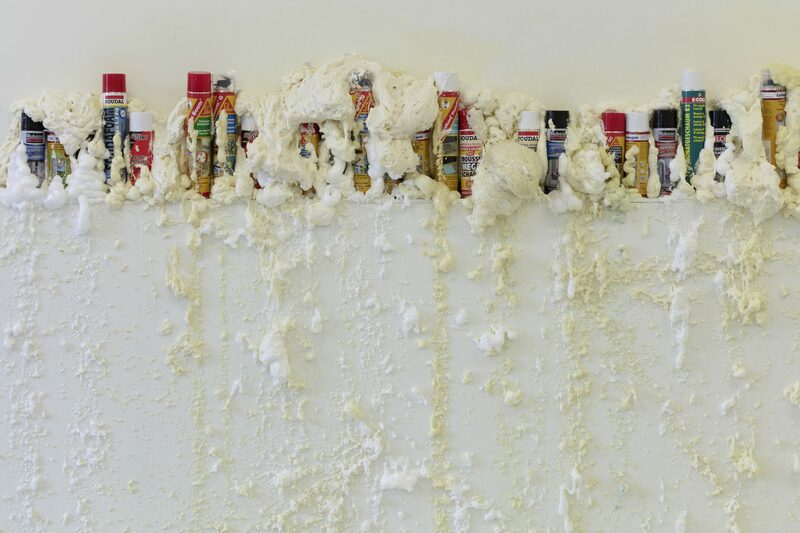 By means of gunshots various containers filled with expanding foam, lined up on a simple, long plinth, were burst open. The chemical mass subsequently spewed out and spread across the whole room. 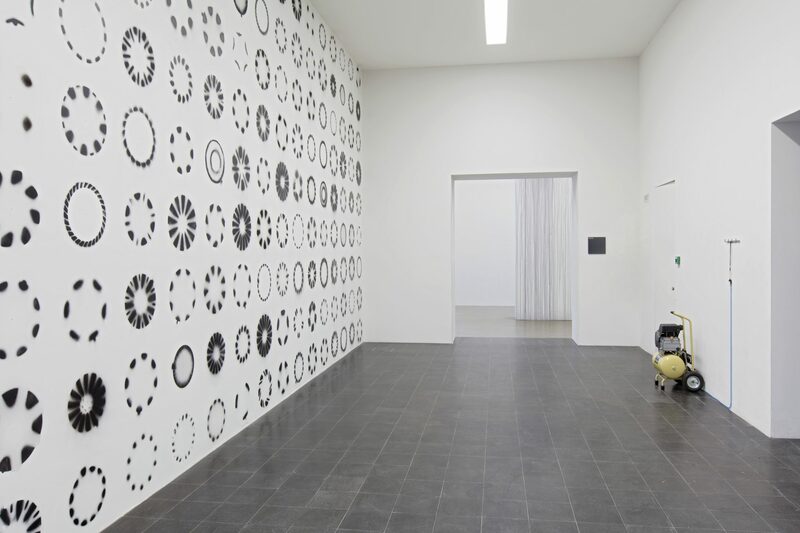 The works Cent fleurs epanouies, 2009 and Stores, 2011 were made at different times, operate however in a mutual interdependency. 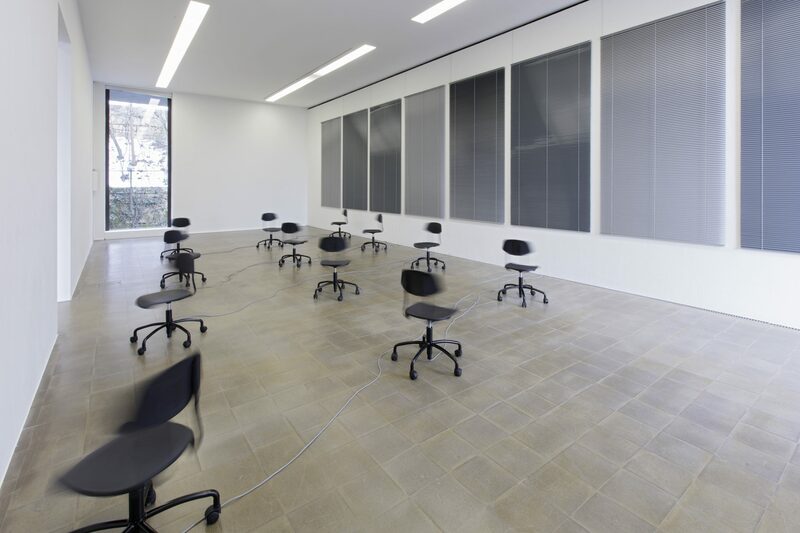 Office chairs casually distributed in the space revolve on their own axes; a group of venetian blinds fixed to the wall rhythmically snap open and closed. 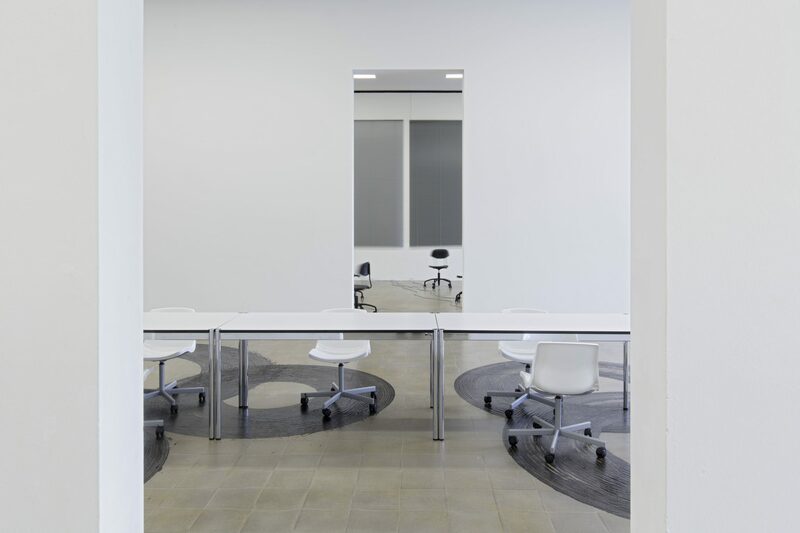 Like a stage set, what appears to be an office room visualises the homogenous processes in administration departments. However, they also make one recognise that office furniture should ostensibly make the working day more comfortable, but that employees cling to a fixed structure by pursuing work from which they have long ago become estranged. 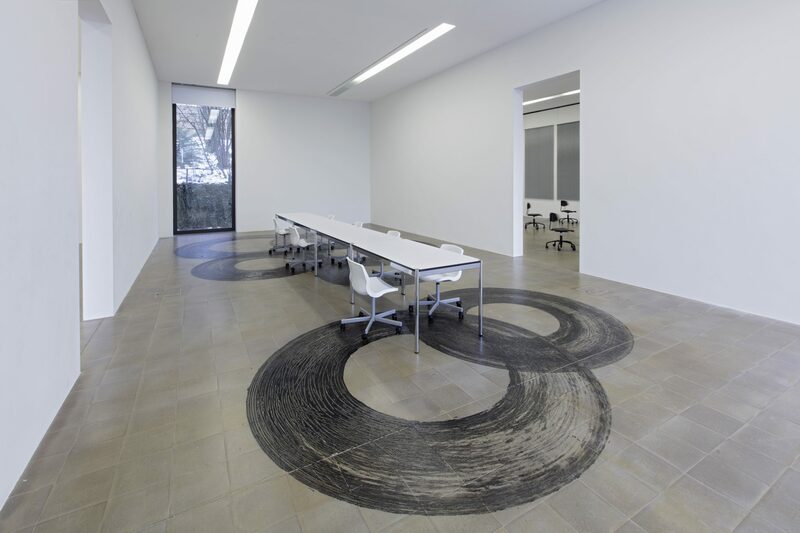 Réunion, 2012 shows tables around which are arranged office chairs standing on circular bands of paint. The chairs seem to have revolved around one point, drawing paint behind them before coming to a stop. They give the impression that productivity has here deteriorated into an alibi. 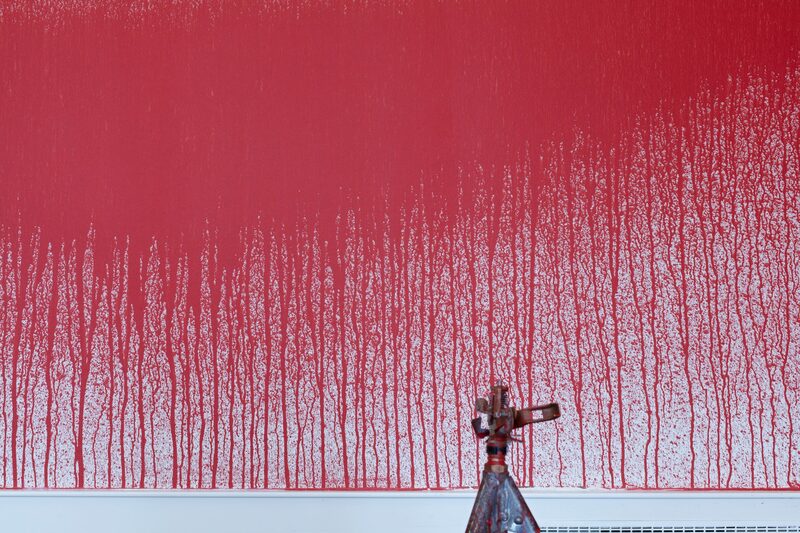 Refering to a collective hangover mood and squandering, in the installation Motif, 2015 wine bottles are placed on a three metre high wall and then destroyed. The entire surface of the wall, which like a barricade divides the space in the middle, is thus covered with the wine that has poured down it. Group dynamics are also to be seen in the work Patère, 2013. In the sweeping corridor sports bags are hung on a long row of the coat hooks familar from changing rooms. Something moves inside them, lending the objects a strange sense of belonging together. 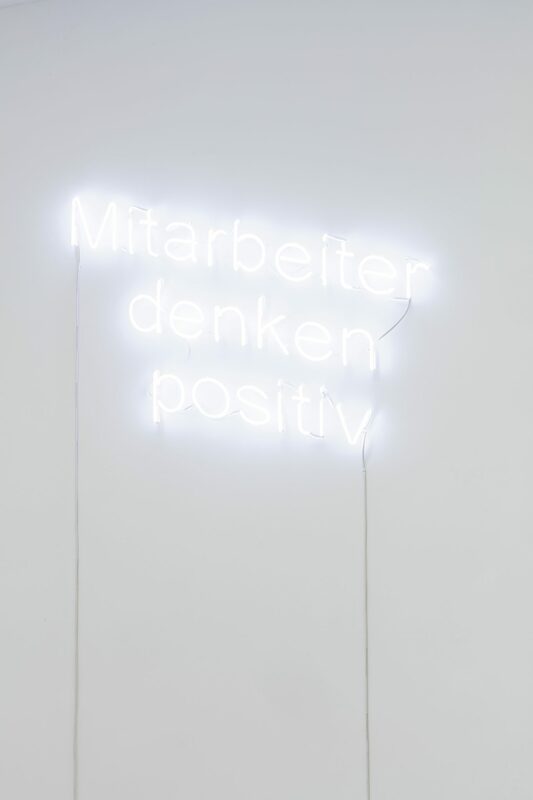 In response to the positive thinking that is continuously required in our society, Delphine Reist presents the neon work Mitarbeiter denken positiv, 2017, that like a mantra of an optimistically inclined company culture encourages positive thinking and behaviour. Formulated thus as a statement, the work appears as an irrefutable fact, also underlining the ironic approach of the other works. Drawn from real life, Delphine Reist’s installations show scenes familar to all of us. Like distorted mirror images of our reality, they appear familiar and, in their skewed logic, at the same alienating. With wit and subtlety the artist has made an exhibition in which technologies and products no longer follow their actual purpose but have broken away from people. In the end, however, they have not thrived enough to lend meaning and justification to their existence. A richly illustrated publication with exhibition views will appear during the exhibition. With texts by Lea Haller, Damian Jurt and Isabel Zürcher, Verlag für Moderne Kunst (ENG / DT / FR).